I was looking at the [Local Safe Company Models] but I wanted to know if you can give me a quick tip while I continue to learn from your site. I will be honest. In the process of putting two kids through college and have about 2 years of work left until I retire so I would like to some what be as frugal as possible. I will pay what I have to pay but carefree spending, even for a great cause, has its limitations for me at this time. If you can give me advice — even if you want to say [Local Safe Company] safes are crap or AVOID these safe companies I would appreciate it. Thanks again for any and all information you can share. Thanks for the kind words about my site. It was a lot of work to put together so I’m glad that you and your friend are find it useful. Spread the word! Sorry to hear about the burglaries in your neighborhood. My mother’s neighborhood has been experiencing a similar rash of burglaries since they put in a bus stop down the road. One even turned into a home invasion because the homeowner was home. It’s really unsettling. If you’re looking for frugal tips on how to protect your valuables without spending a lot of money, you can find over 100 Money-Saving Ways to Protect Your Guns in that article. It’s a good place to start and may give you some ideas. Your situation has a couple special circumstances, so it’s a little different than most of the gun safe customers. The biggest thing to worry about is the cash. You won’t be able to insure it and it’s the thing burglars most want to steal–they don’t actually have to sell it to get cash. Because of the cash, I would recommend that you get a real safe, i.e. B-Rate or higher. This page explains the safe ratings. How much cash you have will give you an idea of what safe rating to look for. This table has guidelines of what rating to get for what value of contents. Because cash is so much more valuable to a thief than guns, I’d divide the table’s Replacement Value of Contents at least in half, so instead of “Up to $50,000” for a B-Rate, you should think “Up to $25,000” or even “Up to $12,500“. Because you don’t have long guns, you have more flexibility on the size of the safe. A normal size jewelry safe should hold all of your valuables. I looked at the safe you mentioned but didn’t see a security rating. Instead of buying a un-rated safe brand new, for less money you can find a used safe with a real rating. 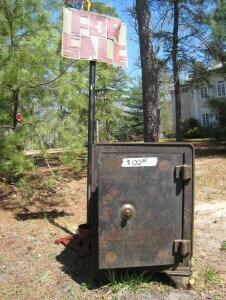 With the economy the way it is, there are lots of used safes for sale from businesses that closed down. Also, since you don’t have long guns, your handguns will fit in smaller safes giving you more options. The best way to get a used commercial safe is to talk to a real Safe Technician/Dealer. The dealer should be a member of the Safe & Vault Technicians Association (SAVTA) and/or National Safeman’s Organization (NSO). Look up “safes” in the yellow pages or online in the SAVTA Safe Tech directory. They should have used models for sale. You can also find safes in online classifieds. Make sure to hide your safe and bolt it down. A friend of mine is framing out the dead area under his stairs to put a used commercial safe, behind a hidden panel. The only way a thief would find that is if someone told him it was there. Good luck and let me know how it turn out! Excellent and thanks for the reply. I will read all the links and keep looking at the site. I shopped around today and this is tough stuff. I will hopefully figure it out, hitting another place tomorrow to see if something jumps out at me. Small, reliable and burglar/fire safe is not as easy as it sounds. The fella today was getting too technical for me but I learned a little. Just wanted to give a heads up. I read a lot and learned a lot on your site. I decided I should go with a TL 15 type safe. Maybe its overkill. I dunno. I just want to buy one once and invest in it. I am not sure if this is the right choice but I am learning. He recommended a TL15 to me that seems really good but I am also looking into other tl15 safes before I decide. Thanks for the update! It sounds like you’re getting good advice. If you can afford one, a TL-15 is a great choice for a pistol safe with a large quantity of cash. Properly anchored, it should keep thieves out even with power tools. Hiding it will even add more protection. For most pistol collections a TL-15 would be overkill; but for securing cash you can’t be too safe. You likely have no recourse or way to get reimbursed if all the cash is stolen. Picture yourself coming home to find all of your cash gone and what you would do. That will tell you if you can afford to loose it. If you can’t afford to loose it, a real safe isn’t overkill. I have seen that video–there’s a ton of great information. Kurt is very knowledgeable and it’s great how much he educates gun safe buyers. I didn’t include the video on the site to avoid confusing readers about a couple points where we differ, for example fire ratings. Thanks again for the update. Best of luck! BTW, don’t forget to look for a used TL-15/30 too. It will be a lot cheaper.